Welcome to Episode #7 in our series of 21 Marketing and Sales Challenges of IT/Tech businesses and what to do about them. All businesses understand that a steady stream of new clients is the fuel that fosters business growth and they recognise you need a pipeline of new prospects. So many Businesses focus on trying to build a pipeline of prospects who are ready to make a buying decision. Because it naturally follows that if prospective clients are ready to buy now they will find you – by reputation, referral, word of mouth, online presence, social presence or even advertising. So, like the “Field Of Dreams” movie they build a great Business, have fantastic customer service, a trusted referral network and strong online and social presence. But somehow never enough ideal clients seem to turn up ready to buy. Why is this so? The problem is Buyers may find you – but are they your ideal clients? Often, I hear businesses say I need more “A” type or ideal clients and when I ask why they haven’t got many of them they shrug their shoulders. Your ideal clients may not be looking where you are known. If you are relying on a great reputation and service to grow you are limited by your network’s ability to “spread the word”. Equally so if you are just relying on connecting via your online and social presence, the ideal contact in your ideal prospect business may not find your website or be looking on the social channels you are active on. Additionally, at any one point in time there are only around 7% of prospects ready to make a purchase decision. The rest are somewhere on that Buyers Journey we discussed back in Episode Six. If you haven’t watched it yet take a look. So what many businesses do it try to is become the “Helpful Guide” and continually push out content on a website or social media channels hoping the clients will come. Only to become frustrated they still don’t attract their ideal clients. While being the Helpful Guide works, it leaves to chance your ideal client finding your content – so it will fail more times than not. That’s what often causes the frustration that Content marketing doesn’t seem to work. You need to be creating more targeted content for your key ideal clients and reaching out to them wherever they may be. In other words you start with who you ideal clients are, deeply understand their needs, connect with them, find out where they are on their Buying Journey (the 93% not just the 7% ready to buy) and then be the Helpful Guide. the clients will come. Only to become frustrated they still don’t attract their ideal clients. If you need more help with planning your sales pipeline, identifying your target market, researching their needs or strategies how to develop a prospecting focus just us a call on (02) 9125 0520 or contact us and request a call back. 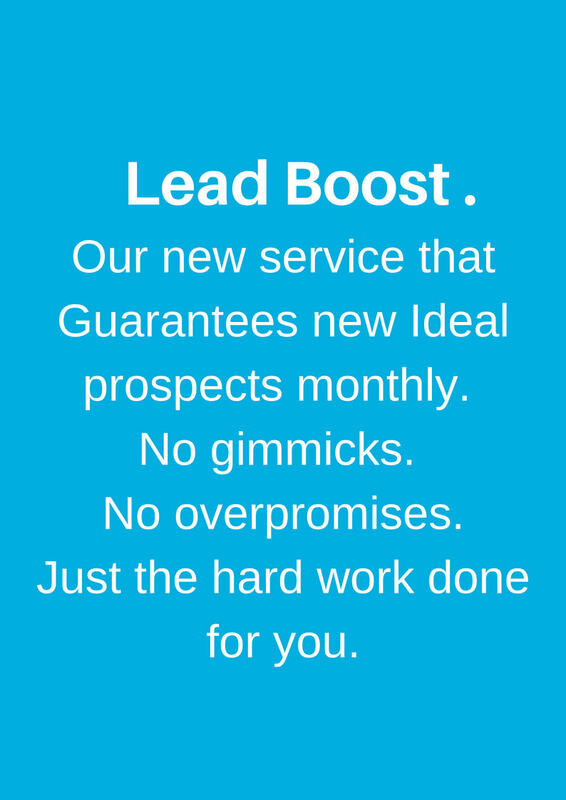 If you don’t have the time to do your own Lead Generation our new Lead Boost program that guarantees to add a fixed number of ideal prospects to your sales pipeline every month for a fixed fee may be the answer. Check it out here.